What would happen if a group of Pre-Heresy Space Marines from a Traitor Legion found themselves in the current timeline? Say from a mishap during Warp travel? Would they be executed on sight, be imprisoned, or forced to join the Deathwatch. These are marines still loyal to the Emperor and the Imperium. They would probably be executed on sight, or if they were lucky taken in for years of lengthy interrogation at the hands of the Inquisition. Most likely though, their ship would be blown out of the void the moment an Imperial Navy patrol found them. Example of The Fallen proves that it is possible to not only survive, but to build their own mini-state somewhere on the outskirts of Imperium. But they would still be considered traitors, and be forced to live as pirates/corsairs. Don't forget that knowledge about Horus Heresy is a very restricted knowledge. How many Imperial commanders know how Pre-Heresy World Eaters armor looks? Without Chaos/Khorn symbols? They might not recognize the armour, but their codes would be antiquated as f*ck not to mention their dialect of High Gothic. But with so many chapters operating on the fringes of the galaxy codes and dialect could be easily overlooked. I understand that if the Inquisition got them there would be years of interrogation to make certain they are not tainted, or Chaos infiltrators. But what would happen to them afterwards? During tne heresy the emperor odred the founding of the grey knights. Some of the founding members were from legions that had went over to chaos. the emperor himself trusted them still. 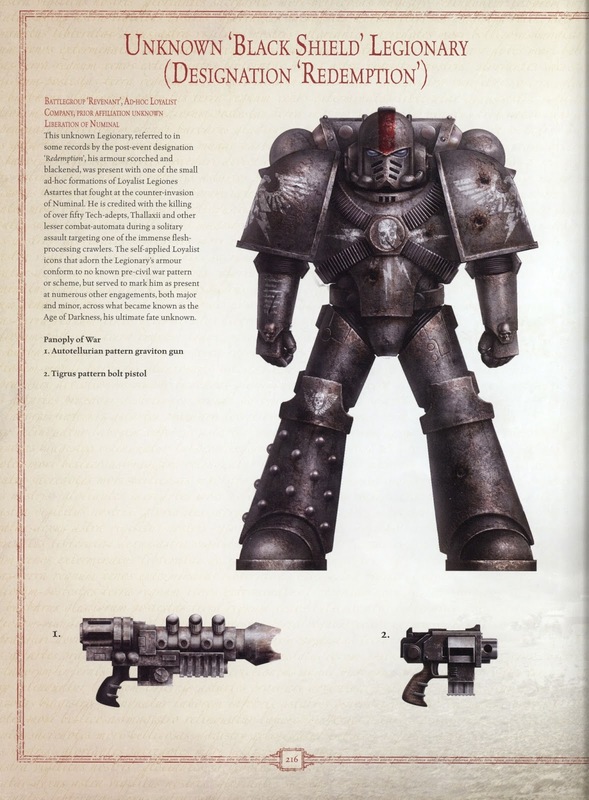 In hammer and bolter 1 there was the story of a force of iron warriors who remained loyal, fought their traitor bothers and played a vital role in saving terra from the chaos invasion. IF such a band of pre heresy loyal marines reached tne imperium in 40,000 and managed to survive very long and IF they came to the attention of an inquisitor who knew the whole truth about tne heresy and the fact that some members of traitor legions remained loyal he would likeky race to reach them because they were vital sources of information and archaeotech from the pre heresy era. Plus these men lived when he emperor lived and a lot of people would like to know what they knew. Also they may have information about tne traitor legions that would serve the imperium well. Also the thought of getting their claws on an intact pre heresy ship and other tech would have some admech types oiling under their robes. Let's see how long it takes a certain pompous troll to snarkcrap on this post then run crying to a mod when i slap him because i'm tired of his abuse. This was what I kinda envisioned. A group of Pre-Heresy marines that were lost to the warp for 10,000 years re-emerging. Unaware of the Heresy, and the betrayal of their Primarch. Depending on whom they run into first could set the stage for a long and adventurous campaign. I can imagine Chaos, the Mechanicum, and the Inquisition all dying to get their hands on the archeotech this ship has. Especially the Inquisition, with these marines knowledge of their former legions practices, tactics, etc, and possible first hand knowledge of the Emperor. Although the Emperor was not seen as a god in those times. Which could cause some issues between them and the Inquisition. If someone snaps this up for a campaign idea, that's fine. Lord knows I've trolled sites looking for ideas in RPG'so and for miniatures conversions. But if I post it, I always give credit where it is due and mention who/where the idea comes from. Hope they give me the same courtesy. It's another one of those issues where the imperium buries the truth because it would be diofficult to deal with. The fact is some members of traitor legions did remain loyal and even became heroes of the imperium during the HH. Of course we can't let the mindless masses know this as they might begin to think there was some good on the 'other side' and that could lead to more heresy. Better to keep 'em ignorant of the truth. BTW, to put it in more modern terms, i wonder if any of the tiger claws remained loyal to the imperium and what happened to them if they escaped badab and made it into imperial space. gave vital data on the traitor chapter to the imperium and were absolved? One hopes. Personally, if I was a loyalist from a traitor legion, then first thing I'd do is repaint my armor and pretend to be some little known chapter. Nobody really knows how many where created (except for a book about the 2nd founding, that gives a number, but doesn't list any names!) Nobody would know and less people would dare ask. Inquisitor: "What primarch is your chapters' genefather?" Capt. Graves (ex Night lords, now Corpse Ravens) : Konr- Errr Corax. yeah definatly Corax. Look at our lanky dark hair. Inquisitor: "Where have you and your men been all this time? and when where the Corpse Ravens founded anyway? We have absolutly no record of your chapter's creation." Graves: " We are a crusading chapter plying the cold dark of the void. Allas our librarium and all records were lost when our Flagship Krummavisur was destroyed in combat with Eldar Pirates." Inquisitor: "Hmm I'm not quite conviced." Graves: "Look,my Corpse Ravens are loyal to the core! You want 600 loyal marines or not? We're ready to take the fight to Horus and his allies!" * Well Guilliman is back, so I guess they would feel a bit at home again. I'm sure some of the second founding chapters were former loyal marines from traitor legions. Would explain why a couple were fleet based with no home world. And as far as the Tiger Claws go. The Lamentors, and Mantis Warriors were eventually absolved, so it's possible they would be too. Although, since it would probably be very few marines, they would most likely have to join the Deathwatch as Black Shields. I am going to use the absolute **** out of this after the current campaign I am running comes to an end. This is amazing. Thanks. I hope it plays well for you.